There is something that fascinates me about sculptures and murals. Beauty whether in a mural like the one on the side of the Sav-Mor drug store in Virden, or in a pot of flowers a Chamber of Commerce planted in a boulevard adds so much to a town. 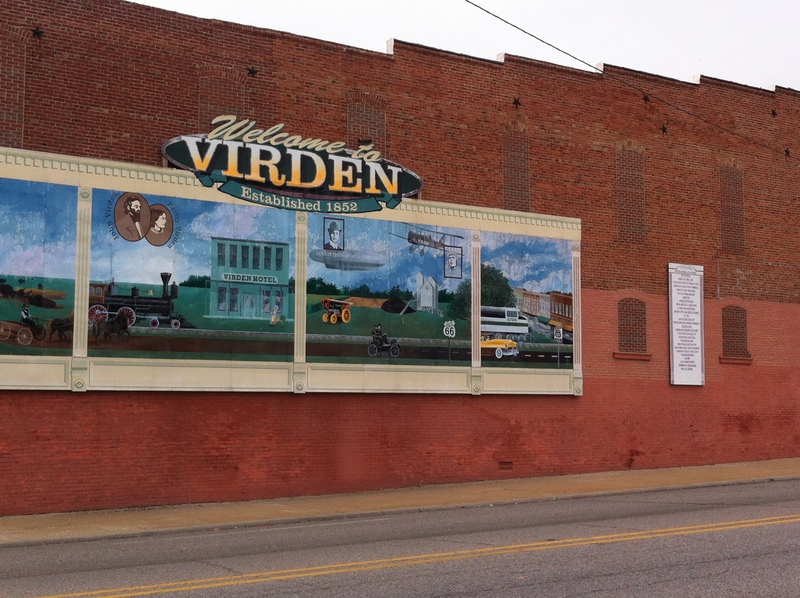 The Virden mural was dedicated on August 27, 2004. Next summer this mural will celebrate a decade of adding to the lives of those living in Macoupin County or those driving down Route 4, as they head to their next destination. The Virden mural may look familiar to residents of Greene County Illinois or Greenville because it was created by Greenville artist John Hubbell. The murals stand 10 x 50 ‘ and shares the history of Virden. Travel on down the road a hundred feet or so and you can see the 1898 Battle of Virden, also known as the Virden Massacre. The battle reflects the coal miner history that often turned violent in central Illinois. Strike breakers came into town on a train on October 12th. When strikers surrounded the train, detectives on board armed with Winchester rifles shot into the crowd. Strikers were also armed and a gun battle ensued with several wounded and twelve deaths. The battle is memorialized by a large bronze mural created by sculptor David Seagraves of Elizabeth, IL. It amazes me when traveling through the quiet town of Virden how much history took place on this now quiet square.